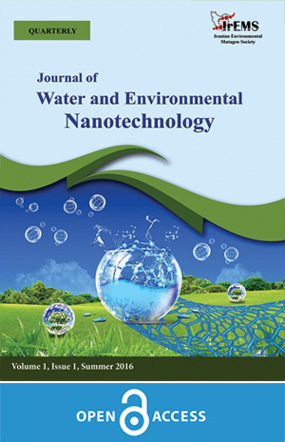 This paper presents the synthesis, characterization of the nanocomposite of silver and chitosan polymer composite reinforced by cellulose fibre and its electrical behaviour in presence of water vapour. The coated paper has been characterized by XRD, IR, SEM and EDX techniques. The size of silver nanoparticles is found to be around 9 nm and deposited uniformly. Chitosan, as well as cellulose, contain a hydrogen attached to electronegative nitrogen and oxygen. This gives a favourable environment for the formation of hydrogen bonds. IR peaks of the composite infer the intermolecular hydrogen bonding between the two constituents. The SEM pictures show that the coating of the fibres with nanoparticles is quite uniform. EDX analysis shows that the coated filter paper has sufficient amount of silver along with carbon and oxygen. The coated paper shows good sensitivity towards humidity. It gives excellent linearity in response with a concentration of water vapour after heat treatment of composite at 130 °C. The sensitivity of the sensor is 0.8 MΩ per unit of relative humidity. Sensing properties originate from protonic conductivity from adsorbed water molecule. Several different kinds and varieties of polymers have been used as different kinds of chemical sensors. Polymers show chemical sensing properties [1-9]. The polymer having the reasonable backbone for hydrogen bonding has the promise to act as a humidity sensor. Thus humidity sensing using polymers has been a major part of the research for a long time. Humidity sensors have attracted increasing attention recently due to its applications in food quality and storage, meteorological studies, environmental humidity for air conditioning systems and also for feedback control in household electric appliances such as drying machines and microwave ovens [10-14]. Humidity sensors based on polymers offer many advantages such as long-term stability, reliability, ease of processing and low fabrication cost. Commonly there are two categories for the humidity sensors: resistive-type [15-17]and capacitive-type [18-19]. However, the poor specific conductivity of polymer sometimes poses great impedance to use a sensor. This problem may be solved by embedding metal particles in the polymer matrix. The properties of silver nanoparticles have been extensively studied in the past few years for their unique optical, sensing and anti-microbial properties. In fact, silver nanoparticles have been one of the most widely studied of all the nanoparticles. Over the years various techniques have been used to synthesized silver nanoparticles . Chitosan, on the other hand, is a polymer which has found widespread application in recent years. Chitosan is a copolymer of glucosamine and N-acetylglucosamine derived from the natural polymer chitin. This biopolymer can be physically modified to give different forms (e.g., powder, nanoparticles, gel, film, and beads), crosslinked with different substances (e.g., glutaraldehyde, carbodiimide, epichlorohydrin, and tripolyphosphate) and used in various fields of application [21-22]. The present paper reports a unique and very simple technique for making nanocomposite of nano-sized silver and chitosan to use as a humidity sensor. Silver has a high value of conductivity. The addition of silver to the chitosan has ensured that the background resistance value of the sensor material is well within measurable range. Moreover, silver is chemically stable and does not react with the polymer. The deposition of composite material would be carried out on filter paper made of cellulose fibers consisting ether or esters of cellulose. Thus the sensor developed using chitosan and nano-sized silver has a background resistance well within the measurable range. The success of humidity sensor lies in linearity of the response curve. This composite shows reasonable linearity in response after the proper heat treatment. 0.2% chitosan purchased from Sigma-Aldrich (weight by volume) in 1 % acetic acid (volume by volume) has been prepared. This solution is mixed with 0.2 (M) silver nitrate in a ratio of 1:1 by volume. Strips of filter paper (Whatman 42) have been taken and soaked in this solution followed by soaking in N/10 ammonium hydroxide for 15 mins. The strips are then exposed to hydrazine vapours for 10 mins which produced Ag nanoparticles. On exposure to ammonia gas, chitosan is precipitated on the filter paper along with silver nanoparticles. Thus on the strips of filter paper chitosan and silver nanoparticles composite are deposited. The strips are washed with water to remove soluble inorganic compounds. The washing is followed by drying. These strips having a smooth deposition are used as a humidity sensor. The amount of silver added to the sample has been optimised. The various different concentration of Ag+ has been tried ranging from 0.05(M) to 0.4(M). But it is found that on using 0.2(M) Ag+ the background resistance comes in a measurable range. Too much of silver leads to a decrease in background resistance whereas too little leads to a drastic increase. When 0.05(M) Ag+ has used the background resistance increases to around 600 MΩ but when 0.4(M) Ag+ is used the background resistance drops down to around 0.5 MΩ. The concentration of Ag+ in the range of 0.2(M) produces the background resistance within the range of 100 MΩ to 120 MΩ. This value is comfortable for designing the hardware of the sensor. This value is chosen since it is neither too high nor too low, thus, ensuring that on absorbing moisture there is a sufficient and detectable change in resistance. After deposition of the composite, the thick films have been backed in the oven at 130°C which makes the thick film mechanically stable. The thermal treatment is necessary to eliminate any hysteresis during measurement. The strips having length 5 cm and breadth 1cm are cut from the sheet of thick film for measurement. The contacts of the strips are made with silver paint. A controlled humidity chamber has been designed . A saturated solution of potassium hydroxide in distilled water is used as a dehumidifier and saturated solution of potassium sulphate as a humidifier. A variation in resistance has been noted by using a digital multimeter (Keithley 6541A). Relative humidity is measured using standard hygrometer associated with a thermometer (Huger, Germany) as illustrated in Fig. 1(a). Schematic of proposed sensing structure is shown in Fig. 1(b). The humidifier/dehumidifier is kept in a dish on a stand. In this process, the temperature of the chamber remains the same throughout the experiment which is being constantly monitored. The ends of the sensor were connected to the Keithley Electrometer which recorded the changes in resistance values. The sensor has been investigated by exposing humidity inside a specially designed controlled humidity chamber. The sensitivity of humidity sensor has been defined as the change in resistance of sensor per unit change in relative humidity (%RH) . Variations in resistance with the variations in %RH for the sensor at room temperature which is around 30ºC have been studied. XRD studies were done using Philips PW1710 diffractometer with Cu Kα as the target material in which 3 major peaks were obtained apart from some other minor peaks as shown in Fig. 2. The peak at 2θ = 38.13° is due to silver nanoparticle formation. β is the breadth of the peak of a specific phase (hkl). λ is the wavelength of incident X-rays. θ is the center angle of the peak. L is FWHM of the peak. The crystallite size of the silver nanoparticles is calculated using this equation. The crystallite size thus obtained is around 9 nm. The peak corresponding to (111) is the plane of the silver nanoparticle. However, the largest peak obtained is at 2θ = 22.67° which is due to the chitosan. Any XRD of the chitosan-based sample gives a peak at around 22°. This peak is large owing to the crystallinity of chitosan which is very well known. The other small peak may originate from the AgCl or Ag2O crystals in the sample. FTIR spectra of the prepared samples (finely chopped up into very tiny pieces) were done in KBr medium with Thermo Nicolet Nexus FTIR spectrometer (model 870). The IR data was taken for the coated filter paper (sensor) and the data was compared with that of an ordinary filter paper and of chitosan as shown in Fig. 3. Filter paper contains cellulose as its constituent. Chitosan and cellulose have very similar functional groups in its structure. Some of the hydroxyl groups of cellulose have replaced by -NH2 and –NHCOCH3. So this makes the IR data quite similar to both these polymers except some additional peaks in chitosan. When the data were compared, it was found that the coated filter paper (sensor) showed almost all the peaks corresponding to both the species. But there is slight shifting and sharpening of peaks in some cases. This can be attributed to the formation of hydrogen bonds between chitosan and cellulose. Chitosan, as well as cellulose, contain a hydrogen attached to electronegative nitrogen and oxygen. This gives a favourable environment for the formation of hydrogen bonds. Thus the changes in IR peaks of the composite infer the intermolecular hydrogen bonding between the two constituents. The silver nanoparticles loaded chitosan film (Fig. 3c) shows the characteristic peaks with a slight shift of the peak 1350 to 1378 cm-1 corresponding to amide III band. In addition, the stretching vibration at 2896 cm-1 conforming to OH/NH2 groups has shifted to 3409 cm-1, which indicates that the silver particles are bonded to the functional groups present both in chitosan. The shifting of the peak is due to the formation of coordination bond between the silver atom and the electron rich groups (oxygen/nitrogen) present in chitosan. This causes an increase in bond length and frequency. Binding of silver with N of the amine and amide group results in decreasing of the intensity of amine and amide peaks at 1644 cm−1. Division of combined peak of amine and amide at 1644 cm−1, also indicates the binding of Ag with O and N of those groups. The peak intensities in the range 1000 cm−1 and 1350 cm−1 due to C–N stretching and bending is very less in silver loaded chitosan nanoparticles because of the complexation of chitosan with silver. SEM analysis reveals that fibrous structure of composite due to deposition of composite on cellulose fiber which is depicted in Fig. 4(a) and Fig. 4(b). The SEM of uncoated filter paper is also shown in Fig. 4(c). A filter paper has a high fibrous network. Such a highly fibrous network with nanoparticle deposition gives a good opportunity for the water molecules to get trapped in this material. As seen in the SEM pictures nanoparticle deposition is formed along the fibres. The coating of the fibres with nanoparticles is quite uniform. Such a uniform deposition enables the sample to be used as a good sensor material. EDX analysis (Fig. 4 d) shows that the coated filter paper has sufficient amount of silver along with carbon and oxygen. The filter paper contains cellulose. So the carbon and oxygen come from the filter paper as well as chitosan. Mapping of silver particle shows that the distribution is very uniform. After mapping at different positions along the coated filter paper, almost same values were obtained. Sensitivity of a humidity sensor can be defined as the change in resistance (ΔR) of sensing element per unit change in relative humidity (%RH)  i.e. The average sensitivity is calculated by taking the average of all sensitivities ranging from 10%RH to 90%RH. The variation of resistance with a variation of %RH prepared by coating on the paper strip has been shown in Fig. 5(a). The curve for the sensing element shows that resistance decreases slowly with the increase in %RH. The average sensitivity is found to be 0.80 MΩ/%RH. In this case, it is found that the curve of resistance versus relative humidity is nearly linear as supported by the Fig. 5(a). The linearity of the sensing element arises early from 10% relative humidity onwards.